The Indian Army celebrated 65th Infantry Day with traditional solemnity and gaiety all across the Northern Command today. On this occasion, Lt Gen HJS Sachdev, the Chief of Staff of Northern Command, laid wreath on the “Dhruva Shahid Smarak” in Udhampur, in remembrance and honour of all those members of the Infantry fraternity, who made the supreme sacrifice for the honour and safety of the country in Jammu and Kashmir. Similar memorial service were held all over J&K. 27 Oct, is celebrated as Infantry Day by the Indian Army as it was on this day (27 Oct 1947) that a Company of Infantry of The First Battalion of the SIKH Regiment was airlifted from Delhi to Srinagar, to liberate Kashmir from the invading tribals supported by the Pakistan Army. This action was ordered by PM Jawahar Lal Neharu after Maharaja Hari Singh of Jammu and Kashmir signed the Instrument of Accession, acceding his kingdom, “Jammu and Kashmir” to independent India. Another significance of this day is that it was on this day in 1947 that India as an independent nation was first time engaged in operations against an aggressor. Infantry, It is the largest fighting arm of the Indian Army, also popularly known as the "Queen of the Battle”, it is the backbone of the Indian Army and its soldiers bear the main brunt in any battle. Physical fitness, aggression and discipline are the basic qualities required in these men. The Infantry units of Indian Army have been modernized, equipped and trained to make the Indian Army amongst the best in the world. On this occasion it would be pertinent to recollect that Pakistan Army had launched ‘Operation Gulmarg’ in early October 1947 using tribals to annex Jammu and Kashmir. Hostilities began in early October 1947, when a tribal rebellion was instigated in Poonch in Southwest Kashmir. By 20th October the Pakistani Army entered the conflict in support of the tribal forces. On 22nd October, 1947, a Lashkar of five thousand tribals invaded the Kashmir Valley from Abbottabad. On 26th October 1947, Maharaja Hari Singh signed the Instrument of Accession thus making Jammu and Kashmir an integral part of India and the Indian Army was thereafter ordered to evict the invaders. The entire campaign was predominantly Infantry centric and its commencement on 27 October 1947 is commemorated as ‘Infantry Day’. 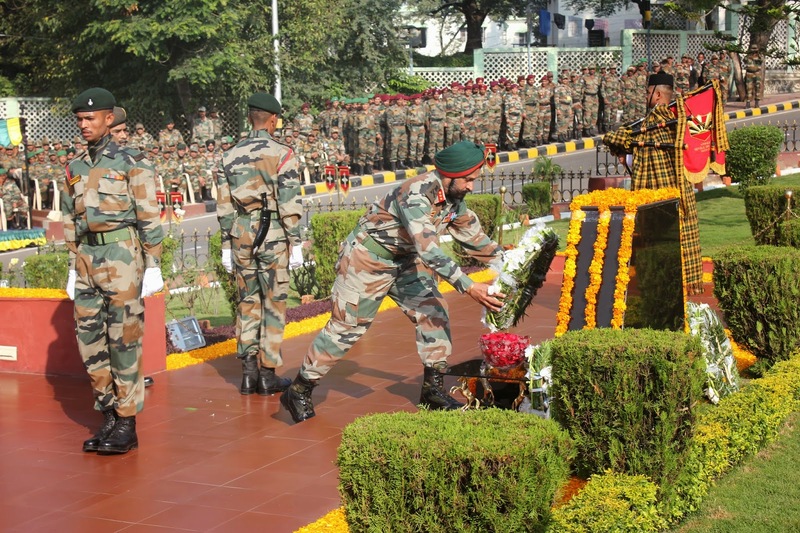 The celebrations today in the Northern Command were marked by laying of wreath at war memorials, Sainik Sammelans and Sainik Bhojs. In his message to the Infantry, Lt Gen DS Hooda, the General Officer Commanding-in-Chief (Army Commander) Northern Command and senior-most Infantry officer in the region, complimented all Infantrymen for their devotion to duty and indomitable spirit while working under trying and difficult conditions. He acknowledged their tremendous contribution in maintaining the sanctity of the nation’s borders and fighting terrorism in J&K.